Peptide mapping is a common technique in the biopharmaceutical industry to characterize monoclonal antibodies (mAbs) for the determination of product identity and stability. Many conventional sample preparation methods are time consuming with digestion times of several hours and can introduce modifications such as deamidation, oxidation, and carbamylation. 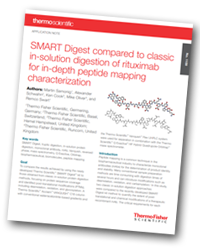 In this study, 'SMART Digest compared to classic in-solution digestion of rituximab for in-depth peptide mapping characterization', performed by scientists at Thermo Fisher Scientific, two classic in-solution protein digestion approaches were compared to the recently developed SMART Digest™ kit method to quantify the extent of post-translational and chemical modifications of a therapeutic recombinant mAb. The critical requirements for each method were the complete sequence coverage of the heavy and light chain and the accurate identification and (relative) quantification of the glycans attached to the asparagine 301 on the heavy chain. Deamidation, oxidation, and carbamylation are induced primarily during sample preparation and were thus monitored for a direct comparison of the different digestion methods. A time course experiment for the SMART Digest was performed to assess the influence of digestion time on modification formation. Visit the 'Biopharmaceutical Characterization Resource Center' to find out more about how the SMART Digest kits provide fast and simple protein digestion with high reproducibility, high sensitivity, and high levels of data quality in a format that's compatible with automation.